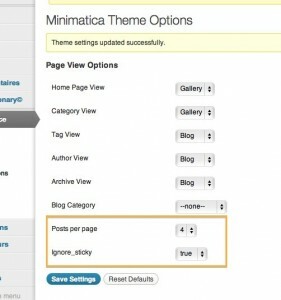 Minimatic is a free well designed WordPress theme offering nice features for pictures rich website. After support exchanges with webmasters wishing to do a multilingual website with xili-language plugin, some issues were discovered. This example is provided as is for users and why not for author. The method of child theme was not used to be simplify the modifications and explanations. and the second, a filter added in functions.php to limit number of displayed images to 4. The solution (tested on WP >=3.3) is based on a unique filter ‘post_limits’ for function ‘xili_minimatica_slider_limits ‘ (written on top of functions.php). The advantage is that only the original query remains. – the ‘quantity of posts’ displayed as image when slider/gallery mode is choosen. 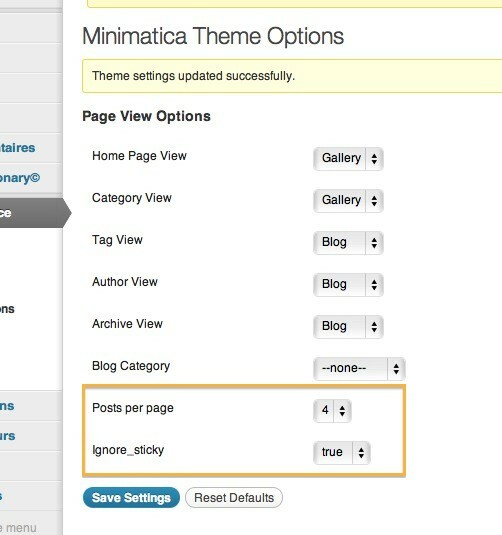 – the ‘ignore sticky’ to decide if sticky post are displayed. With these modifications, a multilingual website can be built with xili-language and the sub-selection of posts according language works well. Note: for current website, the performance is better because only one query is fired. The package is renamed minimatic-xili and version is 1.0.8x. and usable as is ! Ce contenu a été publié dans Experts corner, xili-language. Vous pouvez le mettre en favoris avec ce permalien.